If you have honey bees swarming on your property, please don’t harm them! Simply call a local beekeeper who will come out and relocate them to a new area where they can continue their important pollination efforts safely. The following is a list of beekeepers in the Caswell County area, sorted by township, who will remove honey bee swarms. Some may also remove honey bees from inside structures such as a home, shed, or boat. 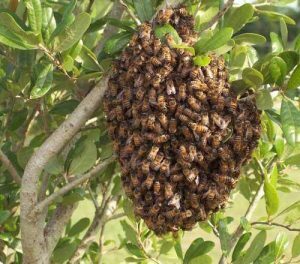 Please let the beekeeper know where the swarm is located, how long the bees have been there and the approximate size of the bee swarm. Also, please do not spray the bees or call an exterminator as beekeepers will not want to remove any honey bees that have been chemically sprayed. Thank you for saving the honey bees!